The Reds have appointed Michael Edwards as sporting director, but the German boss retains “responsibility” for club signings. 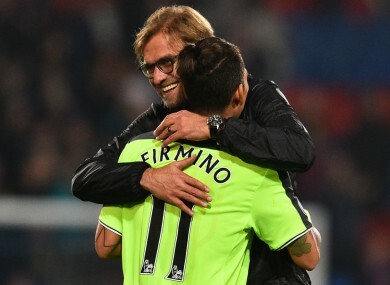 Liverpool manager Jurgen Klopp with Roberto Firmino. JURGEN KLOPP HAS insisted any blame relating to Liverpool transfers should still be aimed at him following the appointment of Michael Edwards as sporting director. Liverpool confirmed the appointment of Edwards on Friday, with the 37-year-old stepping up from his previous roles on the club’s transfer committee and as a technical performance director. Edwards is expected to support Klopp with a constant flow of player information relating to recruitment and the German believes it is a step in a positive direction. However, Klopp was quick to reaffirm that the final say will still come from him. “From my point of view it’s a very natural decision,” he said at a media conference. “When you have the right person in the club then you have to use this person in the right way. That’s what we did since I’m here. Transfers are going always the same way. It’s not allowed to be a one-man show. I know a lot of things but not everything. I like to have the best people around me. “Whoever brings the player, if it’s me or my assistant, then we have a lot of things to watch, to talk about and in the end I have the final say. That’s the most important thing for you to know. Klopp was speaking to the media ahead of Sunday’s home clash with Watford and he reflected on how much has changed since they faced each other at Vicarage Road in December 2015 — when the Reds went down to a 3-0 defeat. “A lot [has changed], thank God,” he added. “The time was really busy. We had game after game, and with injuries. Klopp went on to give Danny Ings encouragement after he was ruled out for the rest of the season with a knee injury, with the former Borussia Dortmund boss certain the striker still has a future at the club. “From yesterday on it’s already a positive story because the surgery was successful and rehab has started,” Klopp said. “We will wait for him and give him all the time he needs. “Danny will be back and will be a Liverpool player 100%. He was very, very close to the team in the last few weeks. Everything will be good at the end but now it’s time to work on the comeback. It’s not a nice story but it’s an important story. Everyone who knows Ingsy likes him. Email “Jurgen Klopp still has 'final say' on Liverpool transfers”. Feedback on “Jurgen Klopp still has 'final say' on Liverpool transfers”.